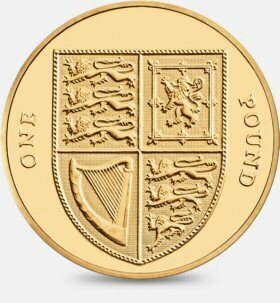 All the round one pound coin designs shown on this page were withdrawn from circulation on 15th of October 2017 to be replaced by a new 12 sided design. In the months before the round pound was withdrawn, we created a printable £1 Coin Collector Sheet to help you complete your collection before the coins could no longer be found in your change. With just 1 pound coin design currently in circulation, see what other coins can be collected from circulation as part of The Great British Coin Hunt by making use of this handy Coin Checker from Coin Hunter. 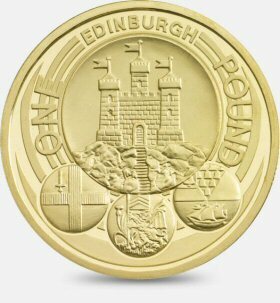 The 2011 Capital cities badges Edinburgh design is very rare, around 1 in 2915 £1 coins have this design. 935,000 coins dated 2011 entered circulation. 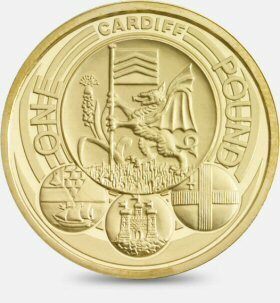 The 2011 Capital cities badges Cardiff design is very rare, around 1 in 1510 £1 coins have this design. 1,615,000 coins dated 2011 entered circulation. 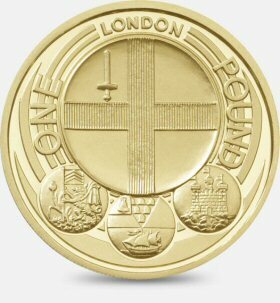 The 2010 Capital cities badges London design is rare, around 1 in 1017 £1 coins have this design. 2,635,000 coins dated 2010 entered circulation. The 1988 Shield of the Royal Arms design is very uncommon, around 1 in 670 £1 coins have this design. 7,118,825 coins dated 1988 entered circulation. 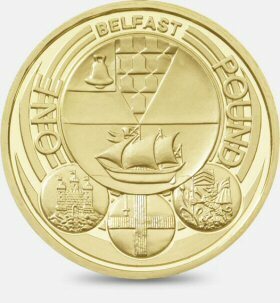 The 2010 Capital cities badges Belfast design is uncommon, around 1 in 432 £1 coins have this design. 6,205,000 coins dated 2010 entered circulation. 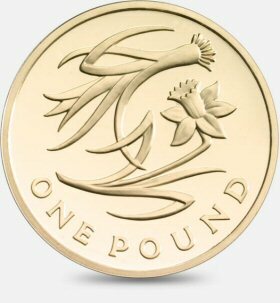 The 2013 Floral emblem of Wales design is uncommon, around 1 in 396 £1 coins have this design. 5,270,000 coins dated 2013 entered circulation. 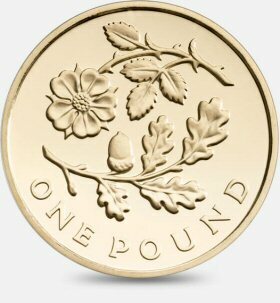 The 2013 Floral emblem of England design is uncommon, around 1 in 396 £1 coins have this design. 5,270,000 coins dated 2013 entered circulation. 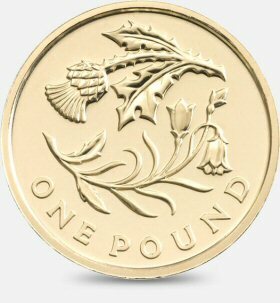 The 2014 Floral emblem of Scotland design is uncommon, around 1 in 362 £1 coins have this design. 5,185,000 coins dated 2014 entered circulation. 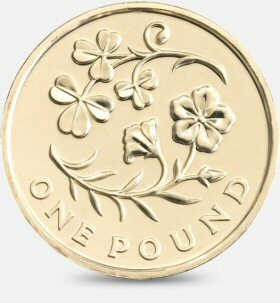 The 2014 Floral emblem of Northern Ireland design is uncommon, around 1 in 325 £1 coins have this design. 5,780,000 coins dated 2014 entered circulation. 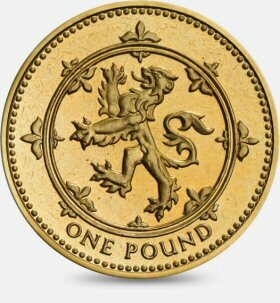 The Lion Rampant design is quite available, around 1 in 80 £1 coins have this design. 29,752,525 coins dated 1994, 1999 entered circulation. 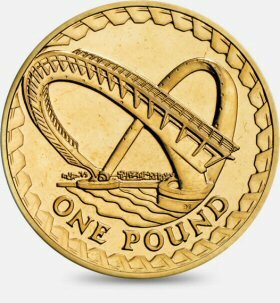 The 2007 Gateshead Millennium Bridge design is quite available, around 1 in 76 £1 coins have this design. 26,180,160 coins dated 2007 entered circulation. 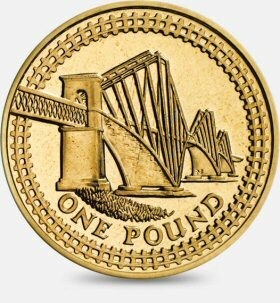 The 2004 Forth Railway Bridge design is quite available, around 1 in 56 £1 coins have this design. 39,162,000 coins dated 2004 entered circulation. 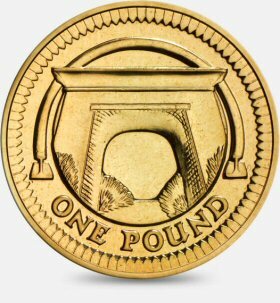 The 2006 Egyptian Arch Railway Bridge design is quite available, around 1 in 53 £1 coins have this design. 38,938,000 coins dated 2006 entered circulation. 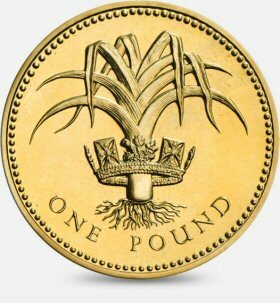 The Flax Plant and royal diadem design is quite available, around 1 in 53 £1 coins have this design. 48,853,076 coins dated 1986, 1991 entered circulation. 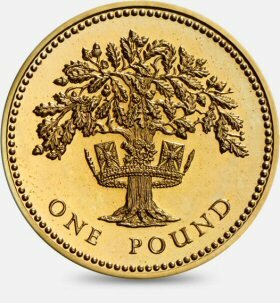 The Oak Tree and royal diadem design is quite available, around 1 in 45 £1 coins have this design. 75,618,989 coins dated 1987, 1992 entered circulation. 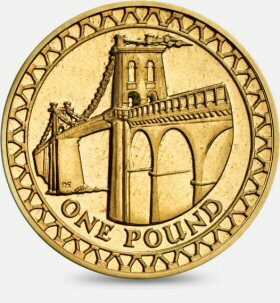 The 2005 Menai Bridge design is quite available, around 1 in 21 £1 coins have this design. 99,429,500 coins dated 2005 entered circulation. 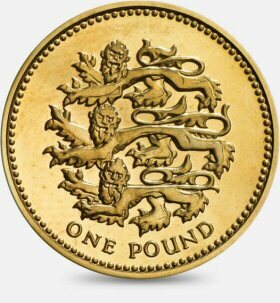 The Three Lions passant guardant design is quite available, around 1 in 18 £1 coins have this design. 134,935,450 coins dated 1997, 2002 entered circulation. 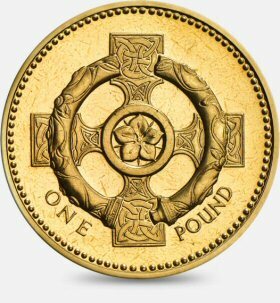 The A Celtic Cross with a Pimpernel Flower design is quite available, around 1 in 17 £1 coins have this design. 153,854,065 coins dated 1996, 2001 entered circulation. 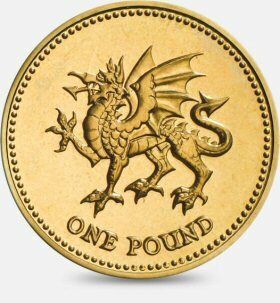 The Dragon passant design is quite available, around 1 in 15 £1 coins have this design. 144,000,001 coins dated 1995, 2000 entered circulation. 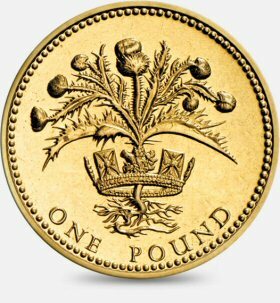 The Thistle and royal diadem design is quite available, around 1 in 13 £1 coins have this design. 216,837,002 coins dated 1984, 1989 entered circulation. 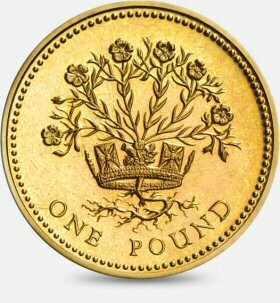 The Leek and royal diadem design is very common, around 1 in 8 £1 coins have this design. 325,700,051 coins dated 1985, 1990 entered circulation. 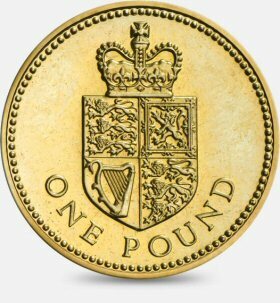 The Shield of the Royal Arms design is very common, around 1 in 4 £1 coins have this design. 374,139,270 coins dated 2008 - 2015 entered circulation. 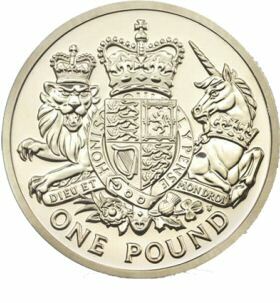 The Royal Arms design is very common, around 1 in 4 £1 coins have this design. 623,304,510 coins dated 1983, 1993, 1998, 2003, 2008 entered circulation. 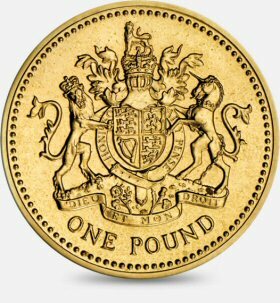 The 2016 The Last Round Pound design is new, so we do not yet know how many £1 coins have this design. An unknown number of coins dated 2016 entered circulation. 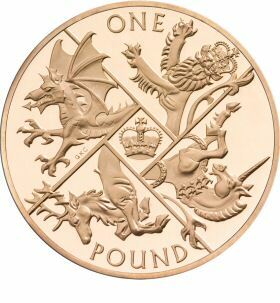 The 2015 Royal Arms design is new, so we do not yet know how many £1 coins have this design. An unknown number of coins dated 2015 entered circulation. 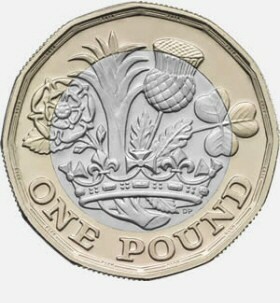 The The New One Pound design is new, so we do not yet know how many £1 coins have this design. An unknown number of coins dated 2016 - 2017 entered circulation. Comparative Rarity Score is a measure of coins availability in comparison to other £1 coin designs. High scores in themselves do not mean there is a small number of a coin in existence, just that the coins do not come up in general circulation very often. The number of coins that enter circulation is shown where available. In order to generate rarity scores / listing positions, we make some assumptions in relation to coins in existance, but no longer in general circulation. This is based on the number of years the coin has been in circulation and on a sample of 500 1 pound coins. The term rare as used on this webpage refers to a coins availibility in active circulation (coins not held in a private collection), not in terms of the number of coins that exist. If you are looking for old coins that are no longer in circulation, you could try an online marketplace such as eBay for circulated examples or find BU (Brilliant Uncirculated) examples in original Royal Mint packaging from one of the many professional UK Coin Dealers.